If anything differs with General-Yo, it’s the unlimited spin times with their Yo-Yos. 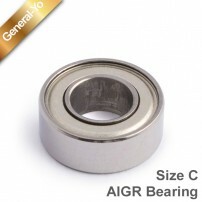 Here is the key: The precision of the AIGR bearing is unique. If your Yo-Yo uses Size C, don’t hesitate to buy, because the AIGR is the best option you can find. The AIGR Bearing, Aircraft Instrument Gyro Rated, is available in Size C, the same sized used in the General-Yo Entheos, the General-Yo Prophecy or General-Yo Majesty.